Sammy Watkins is widely considered to be one of the most explosive players in the 2014 NFL Draft and Watkins has already shown glimpses of greatness in his rookie year. 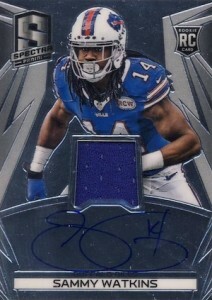 His early play has certainly caught the attention of collectors and Sammy Watkins rookie cards are starting to move. 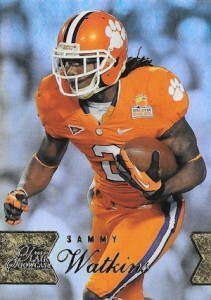 Shop for Sammy Watkins cards on eBay. A three-year starter at Clemson, Sammy Watkins began his college career impressively and finished even stronger. He was named a First-Team All-American in all three seasons and was the 2014 Orange Bowl MVP in his last collegiate game. 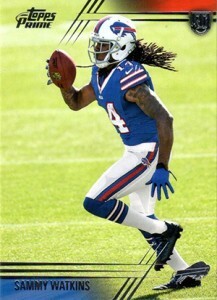 Watkins chose to forgo his senior year and entered the 2014 NFL Draft. Considered a virtual lock for a top ten selection, the Buffalo Bills traded up to make Sammy Watkins the fourth overall pick and the first wide receiver taken. Although he only has one season under his belt, Sammy Watkins has already produced several big games for the Bills and ended his rookie year just shy of 1,000 receiving yards. 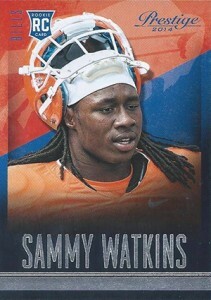 The following guide looks at all the Sammy Watkins rookie cards currently available. Official rookie cards are shown as well as the main options for products without a true rookie card set. Click on the listings or images to shop for cards on eBay. 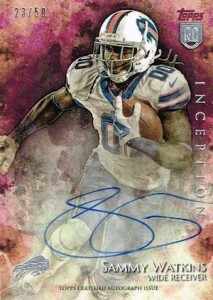 Rookie cards from Topps products are shown first and are followed by Panini rookie cards. 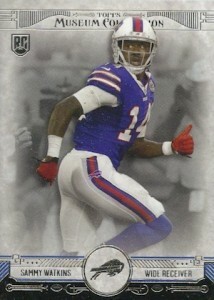 The image won't win any fans but the real appeal from Bowman is normally based on the early availability. The long-term interest will not likely be strong for the 2014 Bowman rookie card. 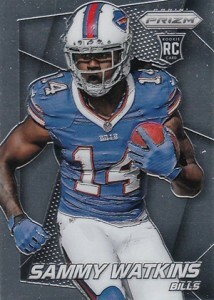 Thankfully, the 2014 Bowman Chrome rookie card for Sammy Watkins used an updated photo for the exciting young receiver versus the airbrushed version above. 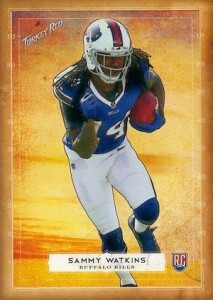 This is one of several appealing budget rookie cards available for Watkins. 2014 Bowman Sterling has arguably the best quality in terms of base design and this Sammy Watkins rookie card brings a good amount of detail. Despite this, prices are inexpensive. 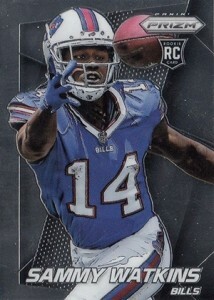 More subtle than previous editions, Sammy Watkins' 2014 Finest rookie card has just enough color to keep it from being boring. Refractors add more rarity and interest for these base cards. The flagship product from Topps manages a budget price while not sacrificing much on the image or design. 2014 Topps continues the variation wave that is sweeping the hobby, and once again, the difference is very slight between the Sammy Watkins base rookie on the left and variation on the right. 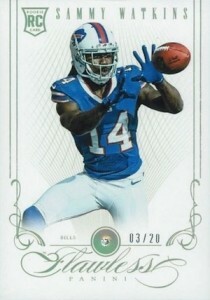 The chromium interpretation of flagship Topps football, Topps Chrome rookies for Sammy Watkins are a popular budget option for collectors. Just like the base version, Chrome also features a short print variation. A variety of Refractor parallels offer rarity and the rainbow chase. 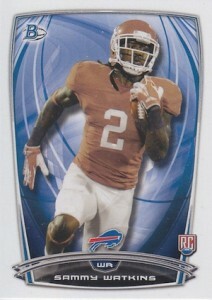 The third time collectors will see the exact Sammy Watkins rookie card design from Topps, Chrome Mini is the smallest of the group. Like base Topps and Topps Chrome, there is also a short-printed image variation. 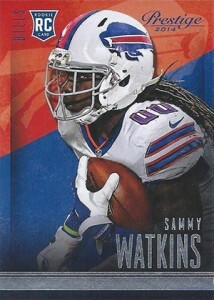 The wild design and vivid colors make this Topps Fire base rookie for Sammy Watkins one of the best overall options for set collectors. Various parallels feature different color combos. 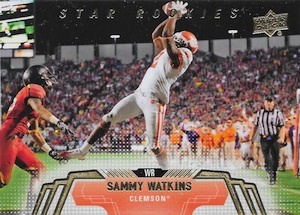 Technically not a rookie card because 2014 Topps Five Star has no true base set, this is the Sammy Watkins card with the most likely claim to rookie status in the high-end set. The ornate design and on-card autographs make it one of the best of the year. Easily one of the most distinct designs in the hobby, 2014 Topps Inception combines an art-like look, on card signature and limited print run. 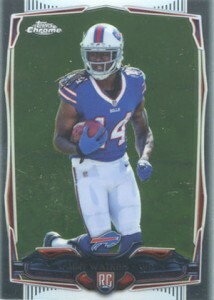 Although it was never confirmed by Topps, the Sammy Watkins card appears to be a short print, with the most common rookie numbered to only 50. The only slight against the card is the "00" jersey number. 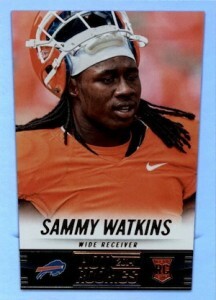 This simple Sammy Watkins base card is found in the high-end 2014 Museum Collection release. While pulling one from a box might not be the most exciting prospect, the rookie card is still a nice budget pickup. 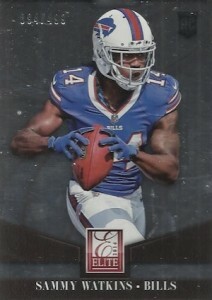 A viable alternative to the Chrome or Finest options, 2014 Platinum adds another chromium budget rookie for collectors to add to their Sammy Watkins rookie collection. 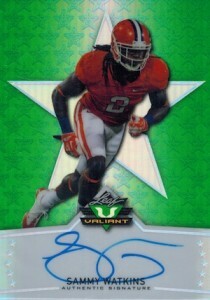 A full-bleed image and vivid green background make this 2014 Topps Prime rookie card for Sammy Watkins pop. The limited short print variation, shown on the right, is also available to collectors. Featuring a simple look with a similar quality to Topps Prime, 2014 Topps Strata is more about the Clear Cut and Strata Signature Relics than the base rookies. The short print variation is also shown. 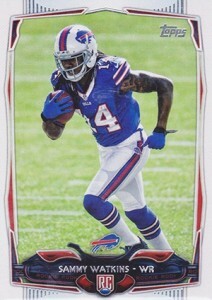 Even with the lower print run and quality design, the base 2014 Topps Supreme rookie card for Sammy Watkins remains a budget option. 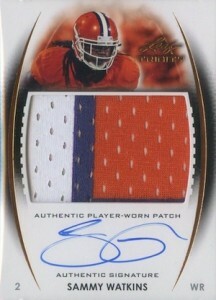 Because of this, the card is one of the best choices for collectors looking for an unsigned base rookie card. Collectors of Triple Threads have come to expect certain things from the relic-heavy product and the 2014 edition is no different. The updated design is more aesthetically pleasing than previous years but the sticker autograph is still a huge negative. 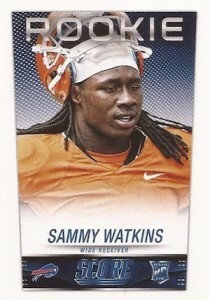 Limited to just 99, this is one of the rarest Sammy Watkins rookie card options. 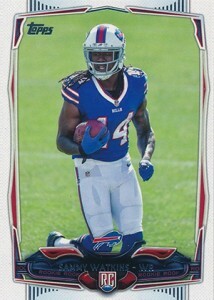 There is also another similar card for Watkins in the base rookie set. 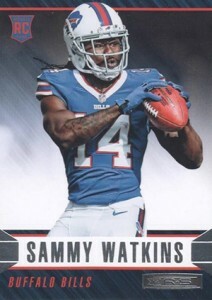 Exclusive to Target instead of online like previous years, the all-rookie release includes both inexpensive base cards and limited variations for Sammy Watkins. 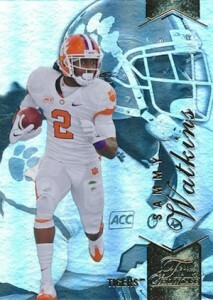 Another recycled image for Sammy Watkins is given a slight boost by the colorful and bold card design. The copper foil gives the card a touch of class and makes for one of the best base designs of the year. 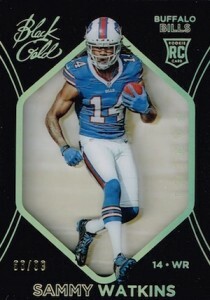 Showcasing a similar layout to many Panini base designs, 2014 Absolute has a zoomed image of Watkins along with a background that has been replaced with a large "X" design. 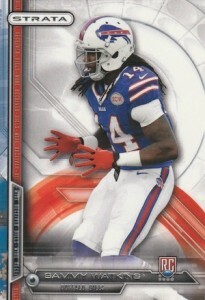 There is also a second card for Watkins in the main set. Numbered to 99, it is decidedly more rare and includes a sticker autograph and quad jersey. Featuring one of the nicest base designs of the year, the mashup product from Panini delivers on the black and gold in the brand name. 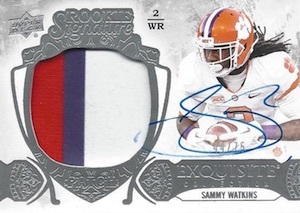 The shadowbox design also includes a variety of parallels and is an appealing option for Sammy Watkins rookie card collectors. 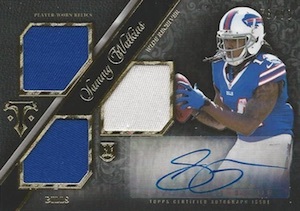 Even with the sticker autograph, the medium jersey piece and limited print run makes this 2014 Certified rookie a solid option to collectors looking for an appealing budget Sammy Watkins autograph. 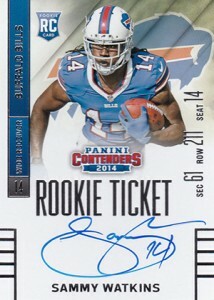 One of the top overall rookie cards for Sammy Watkins, Contenders Rookie Tickets includes a base version as well as two short print variations. The base print run was not revealed, but the middle version(Variation I) has 103 total copies and the third card (Variation II) is limited to just 25. 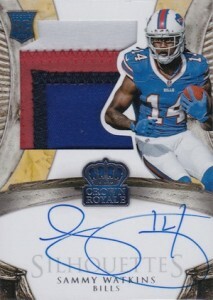 An on-card autograph and medium jersey patch makes this Crown Royale rookie card for Sammy Watkins a top pick for collectors. The larger print run keeps values from taking off and there is also an unsigned version that is more limited. 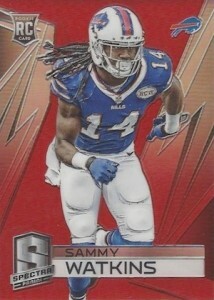 The 2014 Elite Sammy Watkins rookie card won't ever yield huge values, but it represents a strong low-end card. Serial numbered to 999, the supply will likely outnumber the demand, keeping prices low. 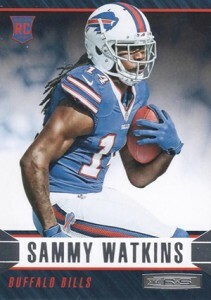 Even without an autograph, the Sammy Watkins rookie in Flawless is easily one of his most valuable and rare cards among his first-year options. The limited print run helps the value considerably, as does the embedded diamond. Basically the premium version of Score, 2014 Hot Rookies is another early release that will be unlikely to maintain any sustained interest based on an undesirable image. 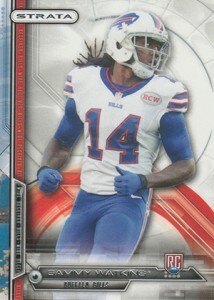 Sporting a photoshopped college image of Watkins, collectors can find better options elsewhere. Immaculate Collection is still a newer brand, but is has already assumed a prominent place in the high-end collecting world. 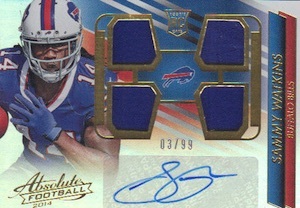 The appealing design, on-card signature and patch piece make this a collecting favorite among Sammy Watkins rookie cards. 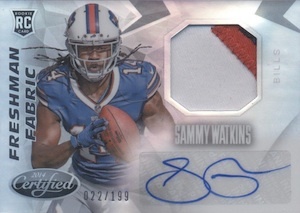 While the print run of just 99 and the large patch is a great attribute for this Limited Sammy Watkins rookies, the overall appeal is hurt by the sticker autograph. 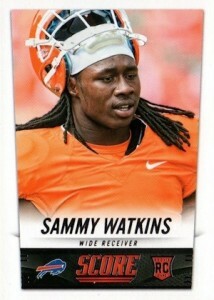 The top rookie card of the year for Sammy Watkins, National Treasures has long been the favorite for collectors. 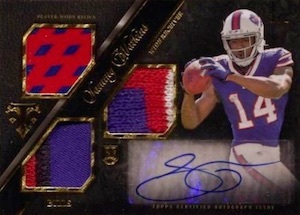 The large patch, low print run and on-card signature means that the NT rookie card for Watkins will top most lists in 2014. 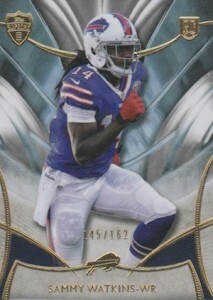 Another card limited to just 99, Sammy Watkins was included with three other hobby favorites in the short-printed Gold subset. The booklet cards includes two different jersey pieces and an autograph. 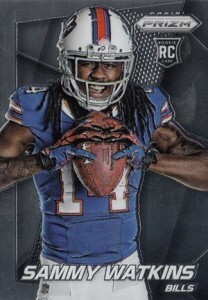 If the base Sammy Watkins rookie in 2014 Prestige looks familiar, it is because the exact same image is used on Score and Hot Rookies. 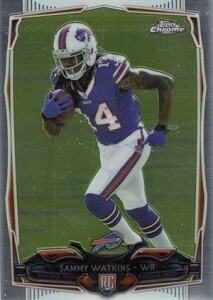 If you prefer a little variety in your collection, a rare variation showing Watkins in his Buffalo Bills jersey is available. Taking variations to another level, 2014 Prizm offers collectors four different cards for Watkins, including subtly different images. 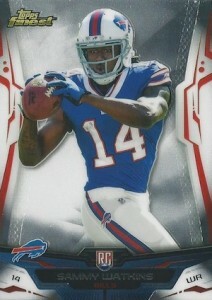 The base rookie is shown first and is followed by the three variations for Sammy Watkins. 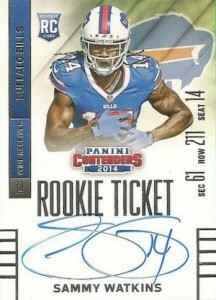 Similar to Prestige, 2014 Rookies and Stars went the variation route with Sammy Watkins. 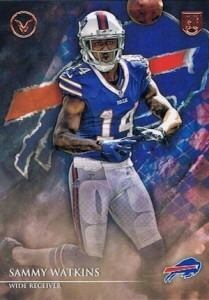 However, both images show the dynamic receiver in his Bills gear, with only a subtle difference between the base card on the left and the variation on the right. 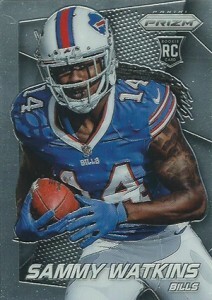 The Prizm technology and low print run is not enough to save this 2014 Select rookie card for Sammy Watkins. The sticker autograph is a killer and dominates the look of the card. 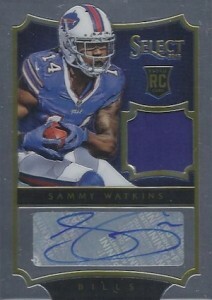 2014 Spectra includes two Sammy Watkins rookie cards in the main set, including a base rookie and an autographed jersey card. Despite having a similar overall look to Select, the signed rookie is much more desirable thanks to the on-card autograph. 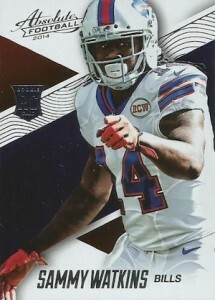 Basically a sticker version of the Score rookie card for Sammy Watkins, the 2014 Panini Stickers rookie is a bit tougher to find but still very inexpensive. 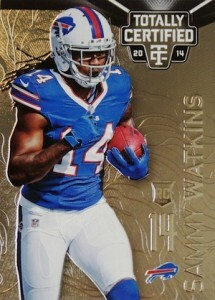 If foil and embossing is what you are looking for, a Sammy Watkins rookie card from Totally Certified presents an appealing budget option. Colorful parallels add increased rarity and value. A well-known budget option, Score is more about quantity versus quality. 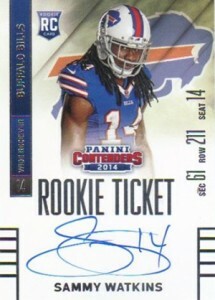 Similar to Hot Rookies, collectors can find better options for a Sammy Watkins rookie card than 2014 Score. Normally baseball products are the only place to find football stars before they make the move to the NFL. However, 2011 Leaf included Watkins in their set which honored high school participants in the U.S. Army All-American Bowl. Teddy Bridgewater and Odell Beckham also played in the game and their autographs can be found in the product. 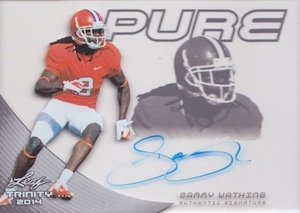 Although it is technically an insert in a 2013 product, this valuable on-card autograph for Sammy Watkins features all the aspects which made Exquisite a titan in the hobby. Now with a college theme, this 2013 Exquisite card is limited to only 75 copies. 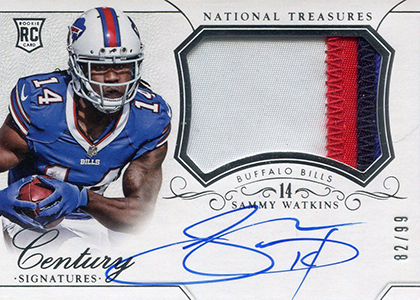 Building on the taste collectors received in 2013 Exquisite, the Rookie Signature Patch for Sammy Watkins adds a large jersey piece to the familiar quality and low print run. 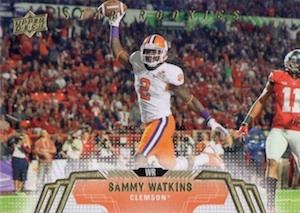 Dripping with 1990s nostalgia, 2014 Flair Showcase offers collectors three different base cards for Sammy Watkins, each with a different layout and rarity. Leaf has taken big leaps in recent years and nowhere is that more evident than in 2014 Leaf Trinity. 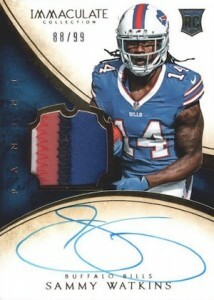 The Jumbo Patch Autograph and Pure Autographs are some of the most popular early cards for Sammy Watkins. 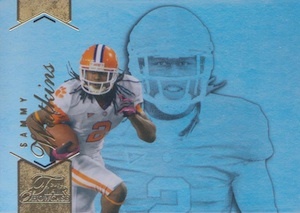 The card quality and design is impressive enough that collectors can overlook the airbrushed college images. Not quite on the same level as Leaf Trinity, 2014 Leaf Valiant has a Chrome feel to it and several colors of varying rarity. 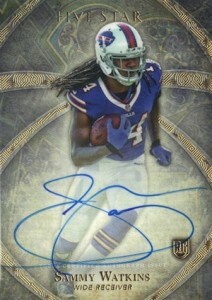 In addition to his base autograph, Sammy Watkins is also included in several autographed insert sets. There is a reason that SP Authentic has been a long favorite for rookie collectors and that has not changed despite the switch to a college theme. 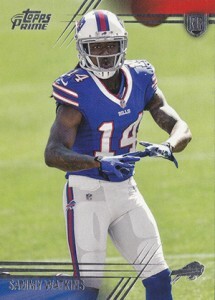 The good layout and design, on-card autograph and limited print run make this one of the best Sammy Watkins options for those that don't mind the lack of NFL logos. SPx might not be the same to collectors without the NFL images, but 2014 SPx still carries on the rookie tradition of previous years with a large jersey piece and horizontal layout. 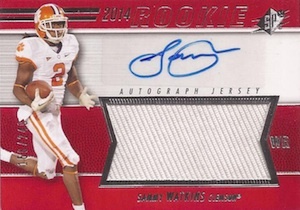 The sticker autograph is adequately incorporated into the red-heavy color scheme and although most of the other cards check in at 425 copies, the Sammy Watkins card is limited to 249. If you are looking for a budget base card with a great action image, and you don't mind a college image, 2014 Upper Deck is a great place to start. 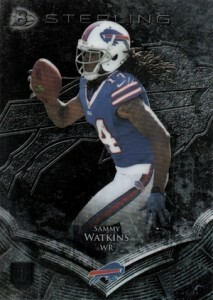 In addition to a short-printed base card, collectors can also find a rare Hobby variation card for Sammy Watkins. 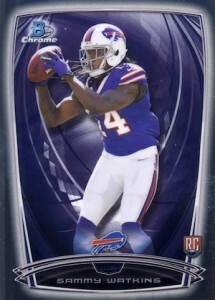 2014 Topps Chrome Sammy Watkins RC Lot of 3! 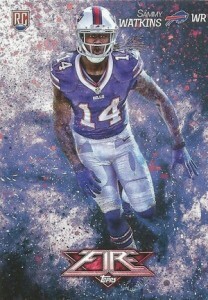 Buffalo Bills, Clemson! 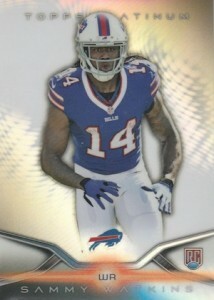 2014 Topps Chrome Sammy Watkins RC Refractor! Buffalo Bills, Clemson! Rare!